Twitter is a great social networking avenue for all educators. Thousands of educators are accessing the resources that are found day and night to better their teaching practices. Beginning Twitter users may retweet, favorite, or reply to tweets they like. Using Twitter this way is not wrong or bad. This post will outline ways that you can advance your use. Hootsuite - This is website and a chrome extension. The extension is called Hootlet. Hootlet and Hootsuite allow you to share a link, post, tweet, or website in a unique way. You have the option to share through Twitter, Google+, Facebook, LinkedIn, or all 4 at the same time. You can create an automatic feed of your blog onto these social networks through Hootsuite but there is a cost. Twitterfeed.com (outlined below) provides a free service of this. You also have the option of scheduling your post to be sent when you so choose. Feel free to play around with the text before you schedule a post! Twitterfeed.com - This is a website that allows you to forward blog posts onto social networks. You can forward to Twitter, Facebook, and LinkedIn all at the same time. 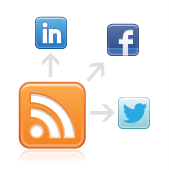 All you need for this tool is a RSS feed to make it function. You can change the message when it is sent to have pre-text and post-text, allowing you to customize the audience you would like to view it. I found this extremely helpful when reaching out to parents as I can post something on my classroom website, and it will forward to social networks, where parents have the option to connect. This tool allows you to post in 4 places with just one post. Crowdfire - The people I follow on Twitter are chosen and moderated in two ways. Are they educators, and do they follow me. I read their profiles on Twitter to see if they are an educator and Crowdfire helps me see if they follow me. Crowdfire allows you to see who unfollowed you, who does not follow you back, and more. Crowdfire also allows you to create a custom message that will be sent out to anyone who follows you automatically! Hashtags - This is a simple thing, but can change your way of connecting. Almost every educational field has a Twitter hashtag. Knowing the content you are going to share and who you want to share it with will help you to pinpoint your audience! Here is a list of weekly Twitter chat hashtags. Keep in mind that educational conferences and school districts have also created their own hashtags to share with their members.